This year Dogforce Fraser River have 6,000 reasons to celebrate post BC SPCA Paws for a Cause presented by Hill’s® Science Diet®. 2018 marks five years of walking to fight animal cruelty for Dogforce Fraser River, and to celebrate they decided to double their fundraising goal raising almost $6,000 to support animals in need. Each year team Captain Wendy Sherlock and team Dogforce Fraser River bring their big smiles, team shirts, red bandanas, and adorable dogs to the Metro Vancouver walk to support a cause close to their hearts. Dogforce Fraser River is a team of close friends that were brought together many years ago by their dogs’ friendships, at the Fraser River Dog Park. Now, whether they’re stretching their legs, throwing a birthday party (sometimes even for the humans) or fundraising for the BC SPCA you will find them at the dog park every day rain, hail, snow, or shine. Rumor has it, over 25 dogs reported for walkies at their last event. Since Dogforce Fraser River started taking part in Paws for a Cause they have raised over $10,000! The key to their success is to spread the word every chance they get – this year they even had new custom t-shirts. We can’t wait to see what they come up with next! 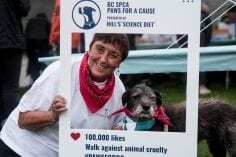 A big thank you to all the walkers, donors, volunteers, vendors and sponsors who joined us this year despite the rain at the BC SPCA Paws for a Cause presented by Hill’s® Science Diet® to fight animal cruelty one step at a time. Together our six walks raised nearly $340,000 to help the thousands of abused, injured, neglected and homeless animals in B.C. Thank you once again to everyone for their support!